Making the most of the great weather, I was spoilt for choice on what to do last weekend. The city was overflowing with outdoor events, from golf tournaments to marathons and weekly markets. I chose to meet some friends at a family event in Dubai. As you would expect, there was a main stage, a plethora of food trucks and pop-up stores. It was packed with families and kids with painted faces. Posting a few pics on Insta, I got a few DMs asking me where I was (back in London temperatures are barely breaking double figures). Of course, I’m in Dubai, at a mini-festival, I replied — mainly to reiterate we do pretty much the same outdoor activities here in the UAE as in the UK, only without the threat of rain to spoil the day. Food trucks have made a huge bang in the culinary scene across the region. However, the concept of street food has been skewed in terms of pricing. When I lived and worked in London, I would often walk down to Borough Market, a daily food market close to Tower Bridge. There would be a huge choice of independent vendors, from Thai to Spanish. The food was affordable; roughly the same as a fast food meal deal. The concept of food trucks or wagons, as they were known, dates back to 1866. Charles Goodnight (great name) would serve food to cattlemen from a horse-drawn freight wagon in America’s west. It was known as ‘The Chuck Wagon’. There are now much stricter hygiene regulations regarding food trucks, but what I don’t understand is why the food sold is so expensive. It’s no secret food in the UAE is costly — statistics issued by Dubai customs show that in 2018 Dh44.6 billion worth of food was imported. So back to the mini-festival. Perusing the line of food trucks, I decided on spicy wings. BBQ chicken is way up there on my food love list. I placed my order and waited, and I got my food. Now to use the word disappointed would be an understatement. In my head I was thinking, I’ve just paid Dh50 for four wings and about 10 fat chips. That’s 10 pounds in my money. Where had this chicken been sourced from, and had it been privately schooled? This certainly wasn’t cheap chicken. Don’t get me wrong, the wings were delicious, and by far the tastiest chicken I have eaten in some time. But Dh50, come on. A 500g pack of chicken pieces is on average Dh10, and to cheat, a bottle of BBQ sauce is approximately Dh12. That’s Dh22 for a big pile of chicken. I appreciate there are costs involved in running a food truck, but there are no waiters, tables to clear and all the packaging is disposable. So operational costs are low, right? 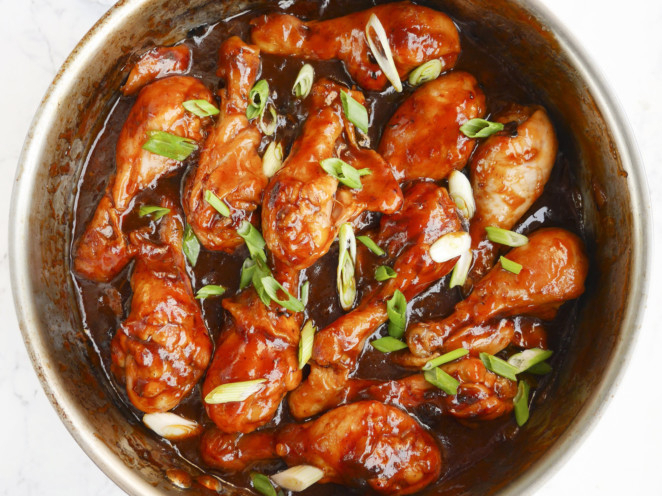 The recipe alongside is my money-saving BBQ chicken recipe for you to try at home, or to even take along to a weekend outdoor event. I do love food trucks but the prices always leave a bad taste in my mouth. A free event shouldn’t turn out to be an expensive family day out. Place the oil in a saucepan, heat over low, add the shallots, saute for five minutes until soft. Next, add the remainder of the ingredients; stir and bring to the boil. Turn down the heat to medium and simmer a further 20 minutes, occasionally stirring until the sugar dissolves. Remove from the heat and set to one side to cool slightly. Finally, pour the BBQ sauce into a liquidizer, or with a hand-held blender blitz until smooth. Leave to stand while you prepare the chicken. Heat the oil in a pan over a medium heat. Add the chicken, and fry until browned. Add the onion, and continue to stir until the onions soften and the chicken is partly cooked. Pour in the BBQ sauce, bring to the boil, lower the heat and simmer with the pan uncovered for 20-30 minutes, stirring occasionally. The sauce will begin to thicken as it reduces. Turn off the heat and allow to cool for a few minutes then serve.